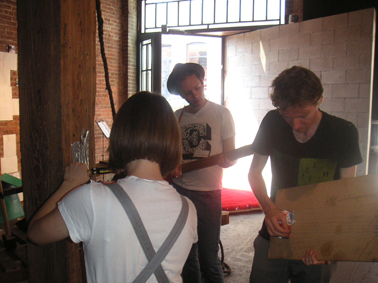 "Mnemonic City (Göteborg/New York)" was a process-based installation piece which was enacted at the Jack the Pelican Presents Gallery in New York (7/7-6/8 06) as part of the group-show "Knock Knock Picnic". The piece was site-specific and used the overlap which exists in my life between the two cities of Göteborg (in Sweden) and New York as it's starting point. This subjective merging of the two cites was carried out through the use of photography, drawings, music, video, paintings, found objects and performance. The piece, which was improvised using the input and stimuli of the city, was continually changing and being worked on and also included collaborations with Marit Bergman (songwriter), Liz Cummins (vocals), Stefan Johansson (drawings), Jens Lekman (songwriter, musician), Dan Lundberg (sound-manipulation and live-mix), Terese Nordström (musician), Stanley Paulzen (songwriter), Alyssa St Vincent (vocals) and Kamakani Weinberg (vocals). The songs on this page were all featured in the show.